Whether you’re caring for someone who’s sick and contagious, or you’re going toe-to-toe with a filthy bathroom, you want gloves that are up to the task. 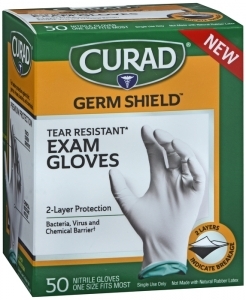 CURAD germ shield Gloves provide 2 layers of protection. That’s 2 layers of tough, high quality nitrile rubber. Nitrile is an artificial latex rubber that helps users avoid allergic reactions common to using natural latex rubber products. It’s really tough – plus, it has high resistance to many common chemicals including gas, oil and mineral spirits. For dependable protection from germs and everything else life throws at you, CURAD germ shield 2-Layer Gloves are the answer. Storage: Protect from freezing, avoid excessive heat. Products should be shielded from direct sunlight, fluorescent lighting, and Ozone. Keep Dry. Dispose of in accordance with local regulations.